Webinars on Targeted Topics That Can Avoid/Fix Design Problems! If you register for more than one webinar on the same form, you can combine the total to determine the discount. For instance if one person registers for two webinars, the price would be the same as two people for one webinar. With the per person webinar price as low as $40, these webinars are quite a good value. A pdf copy of the notes are included. The webinars are one hour in length with time allowed for questions during the presentation and discussions after the presentation. You should allow 1 1/2 hours total in your schedule. New material added that leads to a surprising design rule for PCBs of four or more layers! Thinking of an electronic system as a collection of coupled tuned resonant circuits is a novel way of approaching a system design from ICs, to PCBs, to cables, to entire systems. This approach can expose design problems and fixes for operational, SI, EMC and ESD problems and applies to both analog and digital designs. Every design engineer needs to attend this webinar! EMC engineers will also find this webinar very useful in their work as well. Switch mode power supplies (at system and board level) and other switching devices like class D amplifiers and pulse width modulation controlled devices have caused a lot of noise problems over the years resulting in a lot of weekends and evenings at work for engineers. This webinar will discuss the four modes of noise generation in switching circuits and how to deal with them. The fourth mode is not well known yet causes many of the problems due to switching circuits and is not covered in specifications. Did you know that switching circuits generate noise that can cause intermittent operation of systems with problems occurring once per hour or even less frequently? How this can happen will be discussed and ways of debugging this type of problem will be covered. Examples will be discussed where switching noise generated in one part of a system caused problems in remote parts of the system, including one case where a hard drive was corrupted from a meter away and the drive was not even connected to the noisy supply causing the problem. Recommendations from system level to PCB level are given, right down to the type of inductors/transformers recommended for supplies mounted on PCBs. This Webinar presents a novel way to understand how shielded cables work using a graphical intuitive technique, no math required. You will never think of shielded cables (and unshielded cables as well as paths on PCBs) in the same way again. This presentation is good for both beginners and experienced engineers, and both are not likely to have seen this approach before. The unique treatment of shielded cables leads you to do to good design immediately. A supporting example and data are presented. The operation and relationship of unshielded cables and traces on PCBs to shielded cables are discussed and this connection will be explored in depth, leading to new understanding of unshielded cables and PCB traces as well. This treatment of shielded cables will set aside all the myths you have heard about shielded cables. Most engineers don't realize how simple understanding how shielded cables work can be! This event will improve your designs and lower system costs. This Webinar describes a new form of ESD generated by power supplies in response to a normal ESD event. The response generates some of the nastiest ESD waveforms you will ever see. Over a period of a few microseconds, many Human Metal Waveforms, Cable Discharge Waveforms, corona discharges, and ESD events embedded in other ones, of both polarities can be generated from a single ESD event applied to the product. It is like every possible ESD waveform that can be, is generated from a single applied ESD event. The results have been duplicated in three different laboratories with different scopes, different ESD simulators, and different power supplies. 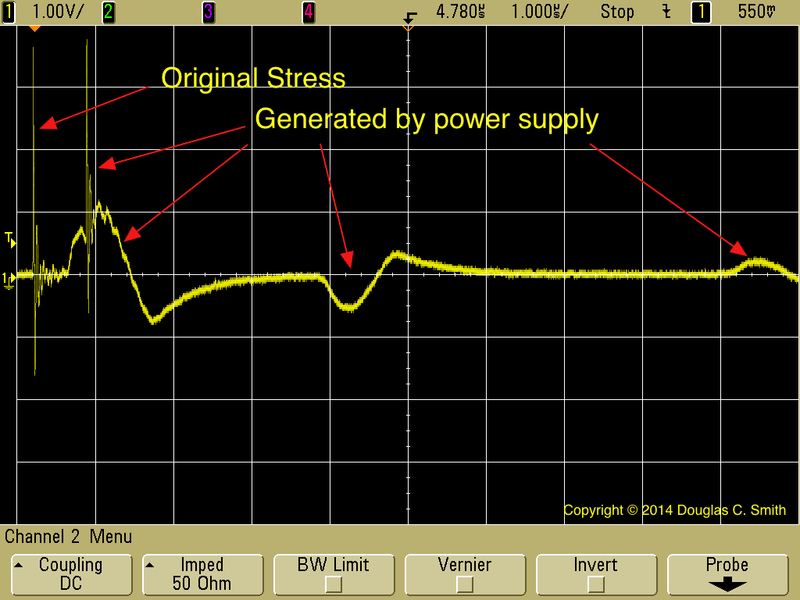 And, this effect often happens at a small fraction of the rated barrier breakdown voltage of the power supply! To date, this newly discovered effect has been observed in small power supplies operating off the AC mains with a two wire interface, but it is possible others may have the same response. These kind of power supplies can include small supplies directly plugged into the mains, brick type supplies used with PCs, and equipment with a two wire mains interface like: stereo amplifiers, set top cable and satellite boxes, a lot of consumer equipment, and some industrial equipment. If you thought normal ESD is as bad stress as there is, you must see this webinar! A simple lab setup to test your products will be described and can be done on any lab test bench. An ESD test area is not needed. The Webinar will start off with a short expose' on how test laboratories can inadvertently fail your product for ESD when it should have been passed and what you can do to insure your product gets a fair and accurate test. After that, this new form of ESD will be described and data presented. New data just added that shows this effect can be induced by EFT on the power line. This is much worse as EFT happens more frequently than ESD and is hidden from view! To see an example current waveform, click here! This is a relatively benign plot with most being much worse. Attendees will view an 8 minute video before or after attending (saves time during the presentation). Important points from the video will be discussed in further detail, such as test strategy and RF signal levels to use. Evaluating the risk of a wireless device to other circuits, within the same device and in other nearby equipment. Finding root cause of problems as well as weak spots in the design leading to excessive risk. Measuring near field shielding effectiveness, how and why it is different than normal shielding measurements and specs, and why you need to make near field measurements. Measuring resonant frequencies of wireless antennas (intended and not so intended) with simple lab equipment requiring no direct connection to the "antenna" structure. These wireless techniques are simple and easy to use. If you design wireless devices, use them in your design, or need to know the risk nearby wireless devices pose to your design, you should see this webinar. It could save you a lot of time and expense. This is a new webinar that will show what you need to do to protect yourself from EMC lab test errors. This presentation can help you avoid a major problem getting your product to market. Have you thought about the effect of passing an EMC test, then making marketing commitments, and then you find the pass was a lab error? This presentation will also cover lab errors that will cause a good product to fail when it should have passed. If you work for a test lab, there will also be a part of the presentation on what you can do to avoid errors that are not caught by normal procedures and certifications. EMC test lab errors are far more common than thought. Protect oneself both as a customer of EMC test services and as a laboratory delivering those services. This material is the culmination of decades of my experience in EMC testing and avoiding test lab errors. The material applies to both commercial and in-house test facilities. In my experience, I can walk into most test labs and find at least one issue that can fail a good system or vice versa. Included are checklists and procedures you can use to insure an accurate test whether you are a lab customer or a test lab. For instance, the conducted immunity test has a little known provision that if missed can result in a significant overstress to the EUT possibly causing it to unnecessarily fail. This overtest has happened in all of the conducted immunity tests I have been present at. I will be holding both public and private deliveries of these webinars. Scheduled, public deliveries are available weekly (see times below) and private deliveries on demand. Contact me at doug@dsmith.org to request a private webinar. You should register in advance to insure a spot and get your pdf copy of the notes before the the webinar, or you can register an hour before the webinar. I will be available by email or at +1-702-570-6108 for at least two hours before the webinar for last minute registrations. You must be registered before the webinar starts. Registration closes 30 minutes before the start of the webinar. Advance registration will allow me to send you the pdf copy of the notes before the webinar.